We all know that other than search engine; Google has wide range of products such as Gmail, YouTube, Google Plus, Google Drive, Blogger, Picasa, Orkut and more. We all might be using all these services for more than Years and you might be storing all the important information like photos, contacts, documents etc. Having a backup of all that information in your PC would be essential. So here in this post we will see how to download all data from Google using simple service. Manual download will take time and it is hard; especially think of your photos and YouTube videos. So instead of surfing all the pages and downloading it manually one by one from all Google products there is an easy way to download using Google Takeout. Whatever it may be like Google + hangouts, Google + circles, Google + streams, Blogger blogs, your Picasa photo albums and YouTube videos. In Google Takeout with just one click you can download all the information from Google to your PC. Google Takeout is a free service offered by Google in which you can access and download all your data that you are using in Google. To access this service head to Google takeout and enter your Google username and password. For security reasons you will be asked to login again if you are already logged in using any other Google products. After the login process you will be redirected to Google Takeout where you can see the list of Google products that is supported by Google Takeout. Now to download a copy of your data click on create an archive and at the next screen you can see all Google products will be selected and ready for archive. You can select any one from the three archive file formats that is .zip, .tgz and .tbz after selecting click create archive and Google starts preparing your files and your compression will begin. Depending on the size of your data compression process may take time and when done Google will notify you through email. So that you don’t have to keep the page open till the process ends. Your files and data’s are now ready for download. Click download and you will be asked to login again and when done all your Google data will be transferred to your PC in selected file format. Note: All your information is more private and so do not export your Google data in public computers. If the file size is large or if you wish only to download data from specific Google products, then you can select the products you want. 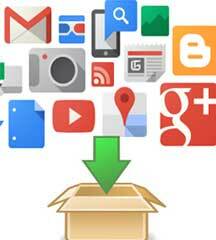 Create archive for specific Google products and download it to your PC. All the data will be downloaded in zip format and to open and see your data just unzip the file. You can see all the Google products in separate folder and all the data’s are exported as it is you uploaded for respective Google products. For example your YouTube videos and image files will be exported in a format that you originally uploaded. Your Google Drive data’s will be downloaded as PDF, XLSX and ODS format. Check out all other file types for each Google service here. After using Google products for years you will have tons of personal data’s stored in Google web server. To check all the data or to download all those data’s Google Takeout has made the process simpler which is something appreciable.